Reduce Sludge, Preserve the Earth | AMCON is the solution for sludge dewatering press and treatment. Nobody wants to destroy beautiful nature of the Earth. 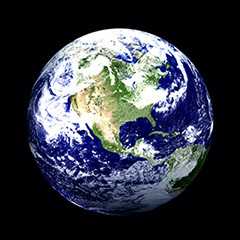 Sadly, however, we might have to say that we destroy it by just living on the earth. The fact is that we produce wastewater everyday by flushing the toilets, draining the bath, doing the laundry, washing the dishes, and so on. For example, the volume of domestic wastewater produced by a family of 4 members reaches two thousand bottles of 500mL a day. The annual total volume of sludge produced from all sewage treatment plants in Japan is approximately 427.8 million cubic meters. Wastewater we daily produce vanishes right away through the drains, which makes us less conscious about the scale of this crisis the earth has been facing. Then, where does the wastewater go? The wastewater goes into the wastewater treatment plant, where the wastewater is separated into "purified water" and "sludge". The purified water is reused while the sludge is just disposed. The problem is that the disposed sludge pollutes the earth and becomes one of the main factors of environmental disruption, which unfortunately few people know about. To purify the wastewater is to remove all impurities other than H2O. Biological treatment is commonly practiced in order to remove the impurities dissolved in the water. Bio-treatment technology uses enzyme produced by microorganisms to remove impurities in wastewater. In other words, microorganisms eat impurities in wastewater and make "purified water." 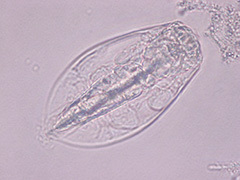 After bio-treatment, "purified water" and "sludge" are left in the tank and the "sludge" is consisted of microorganisms, dead microorganisms and their metabolite. Microorganisms are essential to make "purified water," however, at the same time the more water we treat, the more sludge is generated as byproducts. Wastewater is separated into purified water and sludge at sewage treatment plants, and the purified water returns to the natural cycle. On the other hand, the sludge is just disposed after being dewatered down to 85% water content. 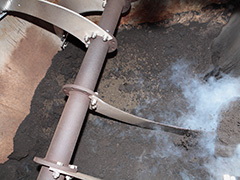 Due to the limited land space, the sludge is incinerated before going to the disposal. Unbelievably, in some countries, sludge is still disposed directly into the sea without any treatment. In any case, sludge causes environmental disruption. Disposed sludge by land-filling gets penetrated into underground water by rain falls, and the incineration generates a lot of carbon dioxide. Obviously, the sludge disposed into the sea will cause ocean pollution. Besides these problems, since these treatment costs a lot of money, some people illegally dump their sludge. In exchange for the comfortable lives we have enjoyed, this problem has been left unsolved over many years. Yet, a lot of people do not even recognize the problem. As developing countries develop, environmental disruption caused by sludge will be a serious global issue. If we close our eyes to this serious problem, the earth will be filled with piles of sludge. AMCON is making a positive effort to solve a growing global issue of environmental destruction caused by sludge. 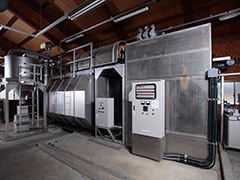 In 1996, we pioneered launch of the "biodryer Dell Compo" for small-scale sewerage systems in the industry. Dell Compo embodies the idea of establishing a local sludge recycling system by reusing sludge within a community it is generated. In short, Dell Compo turns sludge into fertilizer which would be otherwise discarded as industrial waste. Using Dell Compo for a municipal small-scale sewerage system, sludge will be made into fertilizer instead of being buried or incinerated as industrial waste. 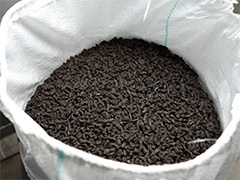 Dell Compo enables sludge recycling, friendly to the environment. It won't contaminate groundwater by landfill. It won't emit carbon dioxide by incineration. 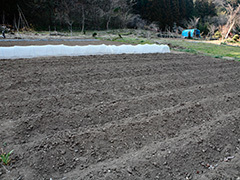 A farmer growing vegetables using the fertilizer made from sludge says, "Since I started to use the fertilizer, the vegetables taste as it used to do in my childhood. This is the true taste of vegetables." This project is appreciated also by the farmers and is environmental friendly. As a protector of the environment, AMCON will continue to deliver products like this. People need to put ethics into action.